Do you want to zoom screen contents on Windows based computer? 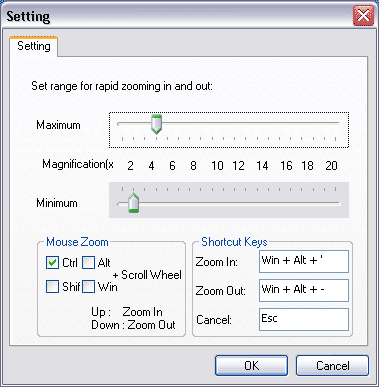 QZoom is an easy to use screen zoom and operation tool like the one in Mac OS X. It allows you to zoom in and out display screen to see finer details. It zooms every elements on the screen, even a Youtube video playing on the computer. It sits on the system tray and you can click right click icon to open “Settings” dialog box. You can use mouse scroll to zoom in/out screen. You can also set keyboard shortcuts to zoom in/out screen. Hit the ESC key to return to normal screen display. Following video shows how to use QZoom program to zoom in or out the screen display. This cool program is available in both install-able version and portable version(no install). Download QZoom installer – QZoom portable and zoom to any part of the screen like in MAC OSX with ease for viewing finer details. It’s great with one display, but show empty black screen with dual display. Finally! This is what I wanted! If I view full screen zoom, maybe there are some problems in working.